Här är vårt utbud av guidade turer och utflykter i huvudstaden i Brasilien - Brasilia. 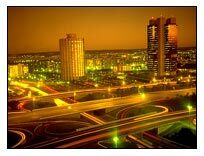 Pick up at the hotel including visits to the Little Church of Our Lady of Fatima, Superblocks, TV and radiotower, Military Sector, the Army's Headquarters. JK memorial, the Congress, the Presidential Palace and many other important buildings. Pick up at the hotel. Visit to the TV tower with a panoramic view of the city illuminated from the TV and radio tower. Passing by the Buriti Palace, JK Memorial, Cathedral, the esplanade of the ministries, the Treis Poderes square and the Alvorada Palace. The tour ends with a dinner in a barbeque restaurant. 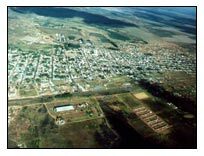 Visit to Cristalina, a little town in the State of Goias 136 km from Brasilia, well known for the active commerce of precious and semi-precious gems and the crystal reservoirs nearby. Lunch in Luiziania, another small town founded in the last century by the Portuguese pioneers in search of gold. 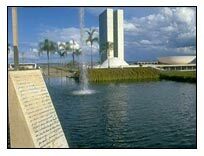 Visit to the National Park of Brasilia, located 9 km from the city and with an area of 28 000 ha. 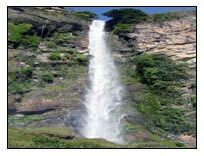 Here, the characteristic flora and fauna of the area are preserved. Visit the Botanical Garden, with an area of 600 ha and the Zoo.Visit also to the City Park, with an area of 4,2 million m2 with sport courts, swimming pools, lake, amphiteatre, bars and restaurant. Lunch in a barbeque restaurant. 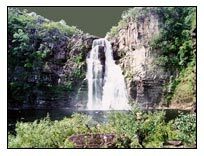 The Itiquira falls, 95 KM from Brasilia, are four cascades, 36 mineral water springs, natural pools surrounded by dense vegetation, camping areas, restaurant, mineral water swimmingpools, sauna etc. A full day including lunch. Bring your swimsuit. Visit to a religious center founded by the spiritualist visionary Tia Neiva (Aunt Neiva). A community with approximately 2.000 people various mediums that assist around 50.000 persons per month. 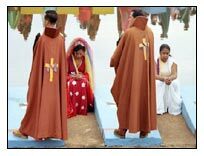 Aunt Neiva, now passed on, entitled herself as being chosen by the Astral beings to perform a salvatic mission of those "elected" and to announce to our civilization the coming of the "Third millenium". Priser på våra utflykter varierar med på hur många som deltar på turen. På vissa orter kan ni också välja att ta utflykten tillsammans med andra som en del i en större grupp. Transfer från och till flygplatsen bokar ni också genom oss om ni önskar det.